Ever since I saw this recipe in the New York Times last week I have wanted to try it, and I finally got to the store and got the red beans and some Andouille sausage to make it. It’s a pretty simple recipe and I think you could probably even adapt it to be made in the slow cooker if you wanted to do it that way so it would be ready for you when you got home from work. Drain and rinse the soaked beans. Heat the oven to 350 degrees. Heat the olive oil in a Dutch oven or other large, heavy pot over medium-high heat until the oil is hot but not smoking. Add the chicken thighs and brown well, 4 to 6 minutes. Remove the thighs, add the sausage to the pot and brown well, another 4 to 6 minutes. Remove the sausage from the pot. Add the onion, bell pepper and celery and saute, stirring occasionally, until tender, about 5 to 7 minutes. Add the garlic and saute, stirring frequently, for 1 minute. Add the thighs and sausage back into the pot along with the beans, the file powder (if using), the red pepper flakes, salt and pepper and enough water to cover everything. Stir well and bring the mixture to a simmer. Transfer the pot to the oven and bake until the beans are tender, 2 1/2 to 3 hours, checking every 30 minutes or so after the first hour and adding water as needed if all the liquid has been absorbed. That’s all there is to it. 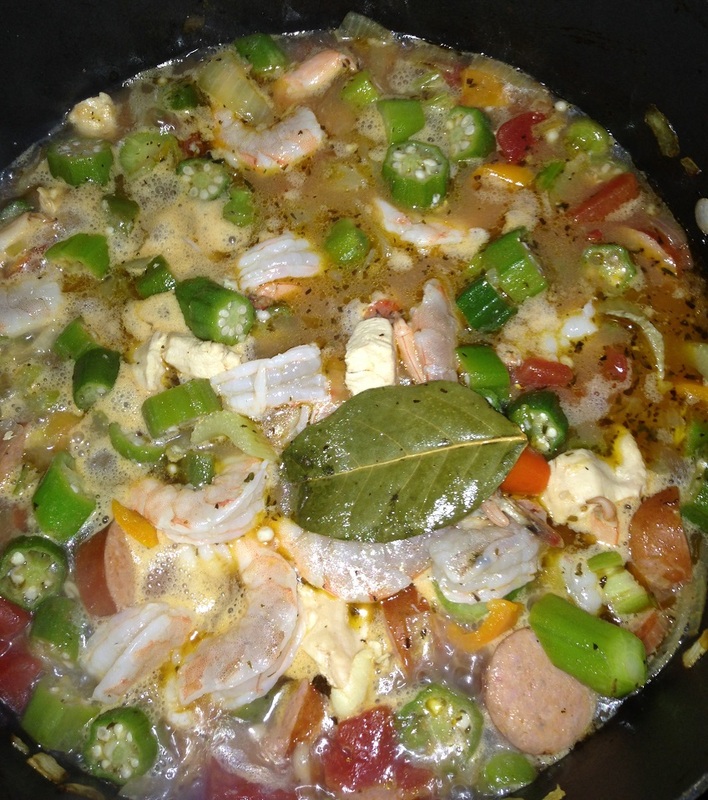 It has a nice, spicy, fragrant smell and the chicken and sausage go great with the beans. 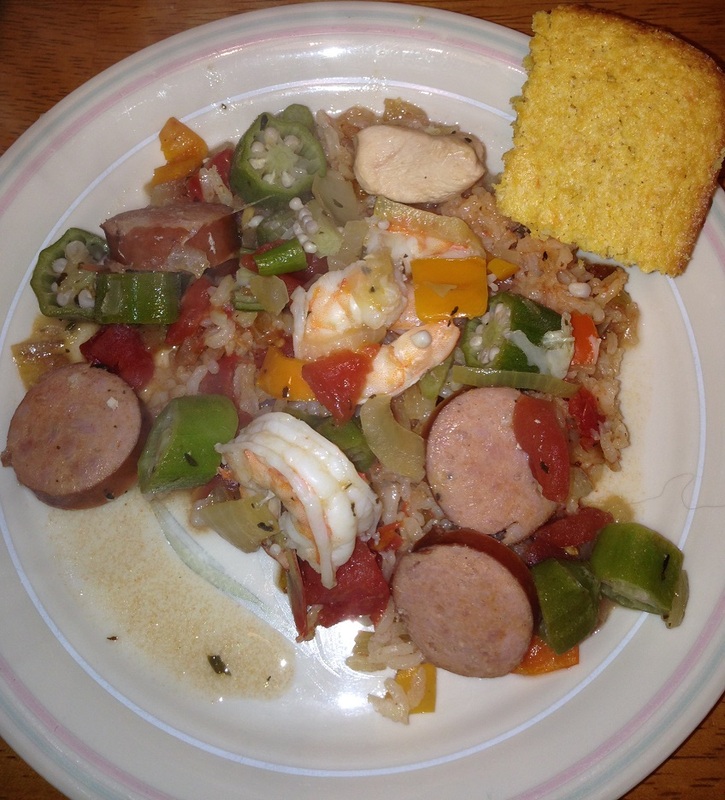 You could easily add some rice to this dish to round it all out. Throw in a side vegetable or a salad, and you are all good to go. It’s just a quick little recipe for today. I have a few other recipes lined to try later in the week, including a new recipe for a banana cream pie, some banana cupcakes, and of course a few entrees along the way. I have lots of fish in the freezer right now, so I’ll be doing some fish recipes in the very near future if you want to check back for that. I also have a couple of special recipes for my own upcoming birthday meal next week if you want to see what we’ll be making for that. Until next time, enjoy the rest of your day and enjoy your meal!